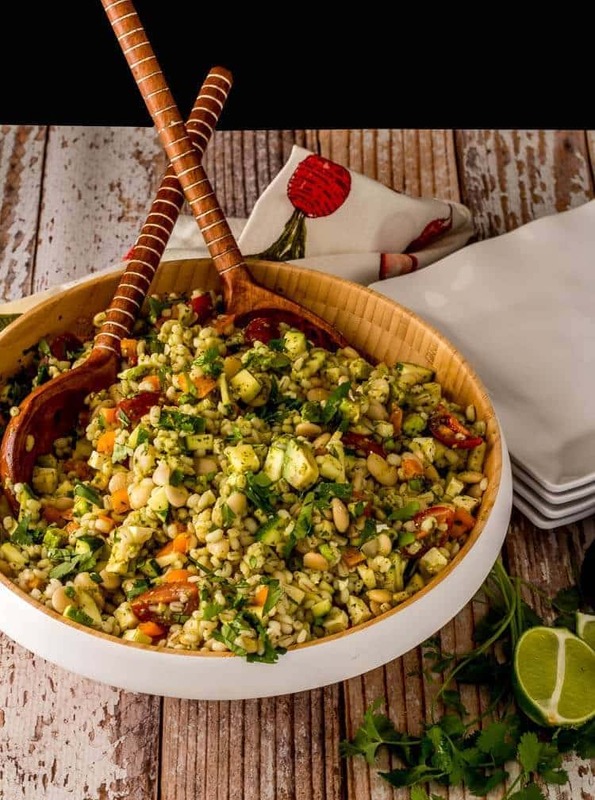 A light and refreshing salad with lots of whole grain and fiber goodness from dried lima beans and grain… Fresh zucchini, grape tomatoes, and creamy avocados with a simple citrus and cilantro vinaigrette make this Lima Beans and Grain Salad with Citrus Vinaigrette a perfect side or light summer supper! Grains and beans. Beans and grains. How many beans equal the protein of chicken? Chicken is a good reference point for most animal protein consuming humans. Unfortunately, plant proteins are incomplete proteins. What does that mean? Plant proteins do not provide all 9 essential amino acids found in animal proteins. However, all is not lost! You can combine those beans with a whole grain, in a Lima beans and grain salad, and you will have a complete protein. 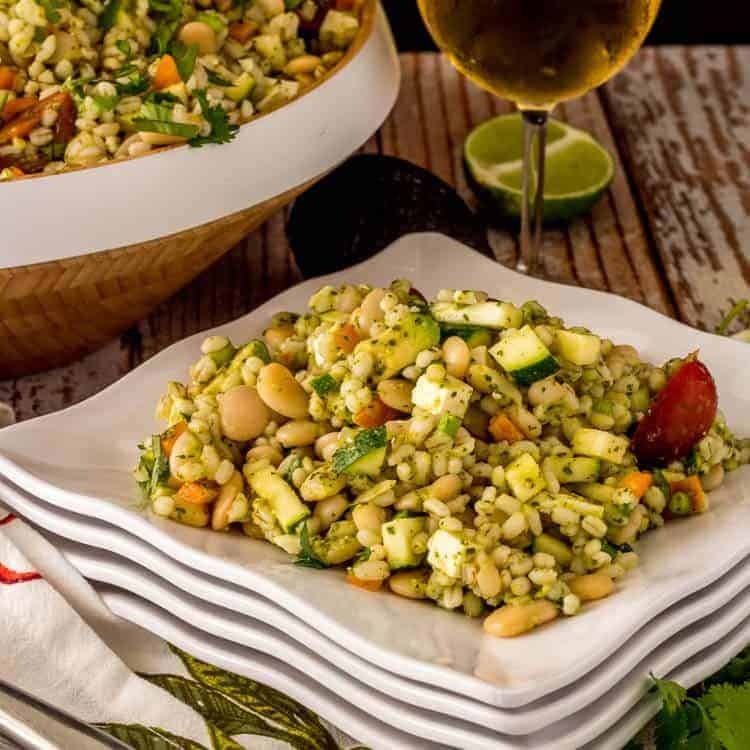 They need not be consumed together, but I submit, they are great together… The texture and fiber from the dried lima beans and barley in this salad is very filling and satisfying, and with the addition of veggies and some tangy cotija cheese, you’ll not miss the animal protein. If you’re looking to practice #meatlessMonday, and want to get a decent amount of complete protein, this dish fits the bill. If you are just looking for a hearty side dish with a grilled chicken breast or a piece of fish, you can’t go wrong. It keeps well in the refrigerator with one caveat – garnish with the avocado rather than mix it into the salad. Avocados die a rather quick death, and they’re just plain ole ugly the next day! If you’ve followed my blog for awhile, you may have noticed “macronutrients” in bold type in the notes section of my recipes? You or may not be familiar with that term… Protein, carbohydrates, and fats make up the 3 “macros” that fall under that nutritional category. Protein (from the Greek word protos meaning first) ought to be a primary concern for everyone, but it’s critical for fitness enthusiasts! A good “rule of thumb” is .8 grams per kilogram of body weight. I’m still cursing the fact that 50 years ago, my elementary school teacher said we’d make the switch to metric units, and it didn’t happen. So… .The recommended daily allowance in the US is .8 kg per 2.2 pounds for a sedentary adult. A 140 pound, relatively sedentary 50 year-old woman would need 53 g per day. If you are active, and/or into fitness, you need more. That means #MeatlessMonday requires looking at your proteins. See How much protein do you need every day? and Dietary Reference Indicator for more information… In short, if you’re aiming to adopt a more healthy lifestyle, be mindful of the macronutrients… starting with protein. Enough of Nutrition 101? Okay. Let’s get to my beans and grains salad… I use a pressure cooker to cook my dried beans and sometimes my grains. When it comes to cooking, I do not plan ahead. Soaking dried beans overnight is certainly not my forté. With a pressure cooker, I don’t need to do a quick soak (2 minute boil with 60 minute soak) and a couple of hours on the stove. For this recipe, I use Bob’s Red Mill Baby Lima Beans and Whole Hull-less Barley. I pressurize the lima beans 30 minutes, naturally de-pressurize 10, and then release the rest of the pressure. I give them a cold rinse to stop the cooking process. I prefer medium-cook barley (whole hull-less barley) in this recipe because it cooks in 40 minutes and has a firm texture. Quick-barley is too soft for a salad, and pearl barley takes longer to cook. The recipe starts with cooked beans and grains. I do keep lots of canned beans in my well-stocked pantry, but for salads, freshly cooked dried beans yield a superior result. The choice is yours! 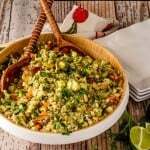 The recipe specifies cooked Lima beans and grains. Prepare them according to instructions, unless you’re using canned beans. Make sure you do give those canned beans a good rinse to get rid of all the gooey starch! I would call this a “fusion” salad. I include aji amarillo chile paste in the dressing – a signature ingredient from Peru. You may wish to substitute your favorite hot sauce or omit it entirely. I incorporate an entire bunch of cilantro (Mexican), the zest and juice of tangerine and lime, some good sherry vinegar (Spanish) for acidity, etc. The briny flavor of cotija is perfect in this salad, but feta makes a great substitute. I am confident you’ll find the dressing ingredients play really well together, and complement the salad ingredients perfectly. Buen provecho! 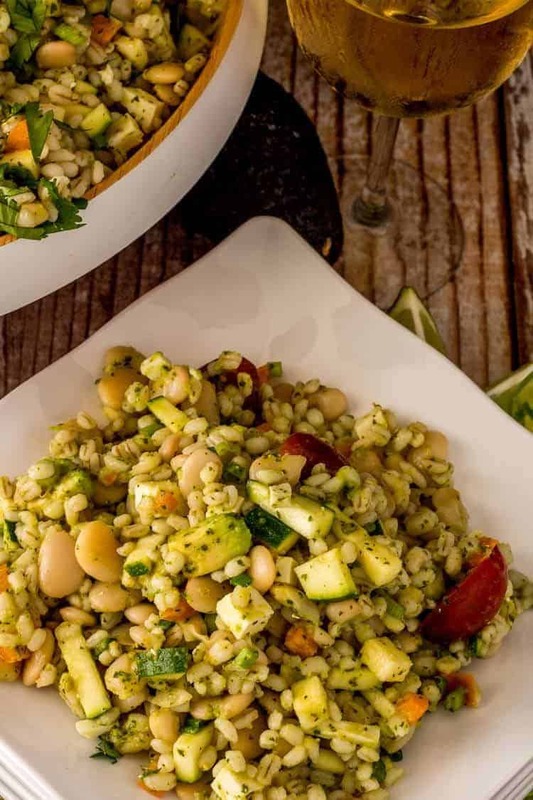 A light and refreshing salad with lots of whole grain and fiber goodness from dried lima beans and barley... Fresh zucchini, grape tomatoes, and creamy avocados with a simple citrus and cilantro vinaigrette make this Lima Bean and Grain Salad with Citrus Vinaigrette a perfect side or light summer supper! If cooking your beans and/or grains, get them started first! Combine all dressing ingredients in a blender or processor. Blend until smooth. Taste for seasoning. Set aside. Add all salad ingredients to a large salad bowl. Toss gently with the dressing. Garnish with additional cilantro if desired. Enjoy! Sherry vinegar is super smooth, making it a great choice when you don't want biting acidity in your dressing. You can substitute a good wine or champagne vinegar. I love the sweet, earthy heat of Peruvian aji amarillo chile. It's gotten much easier to find globally due to the explosion of Peruvian cooking on the international food scene. You can substitute a bit of your favorite hot sauce or chile paste. Always season to taste! As I mention in the post, I pressure cook my dried lima beans. This process takes 40 minutes. I start my lima beans, make my dressing, and then prep the rest of the ingredients. You can substitute lentils, or other firm beans/legumes for the lima beans. Cook according to instructions, and cool completely prior to adding to the salad. Barley is great as the "grain" in this recipe, but we've had it with farro too. You may wish to substitute brown rice (gluten-free), quinoa, etc. This recipe is flexible! Macronutrients (approximation from MyFitnessPal): 403 calories; 15 g protein; 56 g carbohydrates; 20 g fat. Lima beans are so underrated. I'm not sure why we don't see them more. This is a very creative recipe that makes those shine! Love the use of barley as your grain...another underused ingredients. :) Great Salad! I love under-utilized ingredients MJ! I guess I go for the underdog... I'm currently in Peru, and had a traditional Quechua pachamanca today. We harvested fresh lima beans to include in this wonderful meal cooked in hot stone!